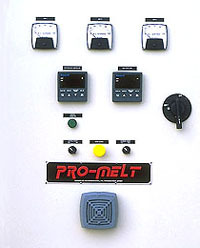 All PRO-MELT Furnaces are designed and built using the highest quality materials and workmanship. The furnace shells are constructed using sheet steel panels with a structural steel frame. The shell is equipped with lifting lugs to facilitate transport and positioning of the furnace. Insulation: The furnace is lined using “Lift-Out” panels made of vacuum formed ceramic fiber on the hot face, backed with a layer of ceramic fiber blanket. The floor of the furnace has a layer of castable refractory sloped toward a “Run-Out” drain, which is backed with insulating fire brick. 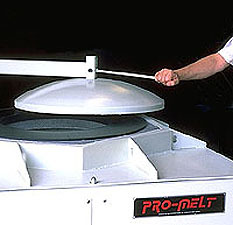 The easy to operate, swing away lid, is lined with ceramic fiber refractory to minimize heat loss. The use of low heat storage materials means faster heat-up and higher recovery rates than conventional brick linings. Heating System: The heating system features fully supported heating elements made of Fero-Chrome-Al wire. The elements are wound around and supported by ceramic refractory tubes. This design provides for free radiation of heat over the entire element surface, allowing higher heating rates and longer element life when compared to conventional groove-mounted or embedded element systems. Elements are located all around the crucible to provide fast, uniform, heat transfer to the melt. “Lift-Out” element panels make it possible to change elements from the top of the furnace without requiring the removal of the crucible. Top access allows the furnace to be placed closer to the casting station since side access is not required for routine maintenance. Unlike “Series” wired elements all Pro-Melt elements are independently wired. This means that a single element failure has no effect on the operation of the remaining elements. Furnace operation may be continued until a convenient time arises for repairs to be carried out. Control System: Temperature is controlled using a dual set-point digital controller to offer automatic selection of day and night settings. The day/night sequence can be programmed to repeat on a seven day cycle. A second digital controller is provided as a “High-Limit” setting. In the event of a failure of the primary controller, the “High-Limit” controller will sound an alarm warning the operator of an overtemperature condition and shut down the furnace. All of the above instrumentation is pre-wired in a wall mounted enclosure ready for Purchaser interconnection to the furnace. All Pro-Melt furnaces are made in the USA and come with the same high quality service you’ve come to expect from UNIQUE/PERENY for over 40 years! Elements can be changed without removing the crucible. Unique/Pereny now offers an integrated package which incorporates the latest in melting technology combined with state of the art material handling equipment. 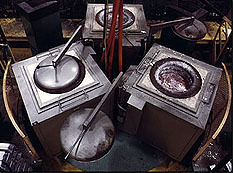 These “Melting Cells” feature three PRO-MELT resistance electric heated crucible furnaces mounted on a turntable. In operation, one furnace is in the “pouring” position one in the “charging” position while the third is in the “stabilize” position. When the “pouring” furnace is empty, the turntable is indexed 120° and the casting operation continues. This process is now in use in the plants of several international suppliers of automotive components. For more information, please contact your sales representative or call us toll free at 1-800-HED-KILN.